Space Patrol follows the adventures of Commander Corey and youthful Cadet Happy as they roam the 30th century universe in their ship “Terra” fighting super-villains Mr. Proteus and Prince Baccarratti and other bad guys. Captured bad guys get zapped with the Paralyzer, then get reprogrammed with the Brainograph. 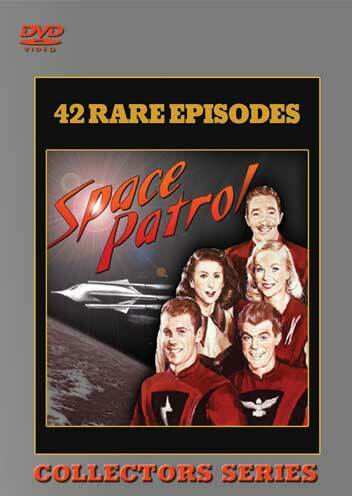 Space Patrol was originally aimed at juvenile audiences of the early 1950s . However, it soon developed a sizable adult audience and by 1954, the program consistently ranked in the top ten shows broadcast on a Saturday. This collection includes 42 episodes. Starring: Ed Kemmer, Lyn Osborn, Nina Bara, Virginia Hewitt, Ken Mayer. DVD, Digitally Remastered. Space Patrol TV shows. Disc 1 – The Disappearing Patrolman, Cosmic Debri Warning, Sabotage of the Jupiter Flight, The Secret of Terra, Abandoned in Outer Space. Disc 2 – The Great Bank Robbery, Mysterious Moon Quakes, Flight of Doom, Invasion, Cunning Captain Quick. Disc 3 – Solo Flight to Jupiter, Jungle Jeopardy, The Scheming Sibling, Mission to Mercury, The Derelict Space Station. Disc 4 – The Electronic Man, Treachery on Terra Five, Frontier Epidemic, The Deadly Sunbeam, Conspiracy. Disc 5 – Rifled Arsenal, The Deadly Flower, Three Exiles, Survival in Ice Desert, Space Fatigue. Disc 6 – Jailbreak, The Big Impersonation, Electronic Space Storm, The Mutation Bomb, The Deadly Glacier. Disc 7 – The Space Derelict, The Green Plague, The Gigantic Space Knife, The Theft of Terra Five, Stolen Evidence, Crash Landing.Disc 8 – The Doom of Planet X, The Phantom Space Pirate, Deadly Radiation Chamber, The Fall of Zarra, Space War, Defeat of Manza.